Well folks, we hope you all had a very good Christmas and New Year. I thought you might like to know how Whisky Boy Jim and I spent our Christmas Day. It is the first time that we have not had Christmas Dinner in our own home, but we felt it appropriate this year to break with our previous customs. We, very kindly, were invited to spend Christmas Day (with an overnight stay) with Alison and Iain Caskie in Crieff ( the home of The Famous Grouse Experience). We started this delightful day off by visiting our grandchildren and distributing presents. It was a cold snowy bright Winter morning and I thoroughly enjoyed watching their wee faces – all full of anticipation and excitement as they wildly tore off the Christmas paper. Even little Chloe who has yet to reach her first birthday was getting into the act taking delight with the ripping process. So, once all parcels from Santa had been delivered we headed back home to collect the next batch of presents for Crieff and our wee dog Freddie. The drive to Crieff was stunning – the countryside was coated in a blanket of pristine white snow as far as the eye could see. The mountains were sparkling in the sunshine and the sky was a clear pale blue. The atmosphere was complete Christmas. On arrival at the Caskie palace we decanted all parcels, overnight bag, turkey and of course dog. We got settled in and started the day off with a glass of Champagne (the first of many). I have got to say that Whisky Boy Jim lived up to his name and does not partake of the fiz (says he prefers Alka Seltzer), so he had a wee dram. The Caskie’s have two delightful boys (actually both are now handsome young men), but for the purpose of keeping their mother content we shall refer to them as the wee boys (Alison have you looked at them lately). We shared out the presents, but the Caskies held our main gift back as we were to guess what it was. They produced a large round solid disc – it looked like a lazy suzan to me – but what do I know. Needless to say we had a few guesses, but were not even close. Once opened we were delighted to find a Whisky Barrell top which had been stenciled Bruichladdich Islay. We were delighted and I suggested we could use it as a table top for when we are in the garden, but was concerned that the weather might perish it. 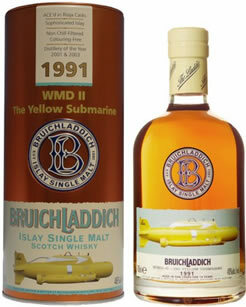 So to commemorate the day Iain decided to open a bottle of Yellow Submarine Bruichladdich ( we suggest you visit Bruichladdich website to get the full story of why they named a bottle of malt Yellow Submarine) which he had actually got signed by the Jim McEwan, The Master Distiller while he was in Islay with us last May at the Whisky Festival. The dram was going down well, both boys (not the wee boys, as they are under age) were developing content smiles on their face as they appreciated the finess of this dram. As the day wore on we, like so many others, we progress through a delicious meal, prepared by Alison as I was barred from the kitchen. The table looked fantastic and it was evident that Alison (who can be a little lade back) had really pushed the boat out to make this a really special Christmas meal – to the extent that she had a dress on all day !!!! The meal was excellent and we finished off by playing a game of Yes/No. By this time the boys were getting a little merry and by 9.00pm I can say that the submarine was well and truly sunk. What amazed me was that I didn’t even notice them topping up their glasses. Iain and Alison were wonderful hosts and we cannot thank them enough for making it such a good day. Even better Iain cleared up all the kitchen while Alison and I got in to our new Christmas PJs and blethered. Our overnight stay was complete by indulging with a hearty Scottish Breakfast, but some of us opted for Jim’s scrambled eggs with smoked salmon. Our intention was to head off to Gleneagles to finalise festivities and have a glass of Champagne before heading home, but we hit a blizzard as we approached Muthil, so decided it would be prudent to head down the road just in case we got stuck. So Gleneagles will be for another day when the weather is better. 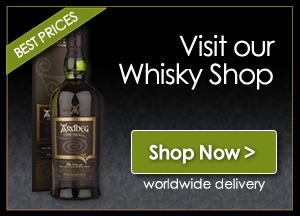 I hope that you all have had as happy and contented a Christmas as Whisky Boy Jim and I have had. Jacqueline, A Whisky Boy Wife.